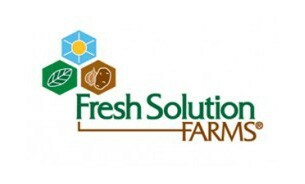 Fresh Solution Farms, LLC is a state-of-the-art potato growing storage, packing, and shipping facility in White Pigeon, MI that was built in 2008 to allow the Network Partners to better serve their Midwestern customers. Supplied with potatoes grown by Fresh Solutions Network owners on over 12,000 production acres in the Midwest and Florida, the 144,000 square foot facility features climate controlled bulk storage capacity for 10,000 tons of potatoes, five receiving methods to minimize bulk delivery delays, and four packaging lines to accommodate all sizes and types of retail and food service packaging configurations. Like all Fresh Solutions Network Partner operations, 100% of the growing acreage and the storage/packing facility are Primus GFS certified. Fresh Solution Farms staffs a dedicated logistics team, and the facility's operational capabilities include over 22,600 square feet of climate controlled shipping and cross-dock capacity, three rail loading bays directly connected to a Norfolk Southern Rail Spur, and six truck bays with easy access to Interstate 80/90, all of which represent cross-dock and backhaul opportunities for our customers.